I hope this picture reaches you all well. One of the incredible things about Nicaragua is the capacity of the people to smile against all the odds. Just take a look at the faces of these people. All of them have allot of reasons not to smile, but most of them smile easily. We have so much to learn from the poor. If you could only know some of the stories behind the smiles you too would be impressed. Stories that the poor the world over experience: inter-family violence, abuse, kids abandoned by the parents, youth with no hope, drug and alcohol addiction, unemployment, etc. 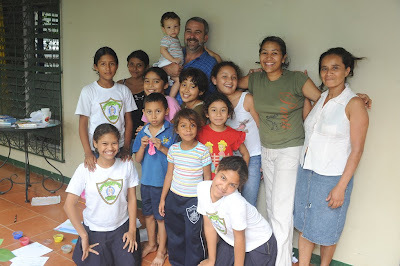 The Nazareth where we live is in a barrio called Espinoza Martinez and is a mixture of smiles and poverty. This neighborhood is located on the outskirts of Managua and consists of two dead end streets, made up of mostly poor - working class families (mostly unemployed). It is in this neighborhood where we try to share the Gospel, not by running any great projects in the area, buy by simply trying practice the spirituality of brother Charles de Foucauld, which consists of being with the poor, sharing their daily lives, labors and worries. Above all, by seeking to be a real presence (the presence of Jesus) and a friend and by staying there. We have just completed one year in our new Nazareth. We have been tested, questioned and now accepted by most of the families in the area. They are happy to have us with them. But is not easy, we see things that are not very good, difficulties that we can do nothing about. In our Nazareth there are undernourished kids, abused kids, there are scores neighborhood "drunks" who hang out on the street corners (they are "members of the community", who always greet me warmly and offer to share a drink). Actually, they prevent other gangs from coming in the neighborhood. We see the elderly with no possibility of decent health care and youth with little perspective of a future different that the poverty in which they live. We see the frustrated unemployed men and women, desperate for any sort of job (At least once a week people come to me asking for work or a contact of any sort). Often the turn in their frustrations to the bottle for some relief and the kids end up paying the price. As each month goes by, we also see and feel the weight the basic food basket rising, along with energy, gas, transportation and water services (in the places where they exist). How the vast majority of the poor of this country survive is nothing short of a miracle, yet is caused by "the Sin of the world". There is nothing good about romanticizing poverty, poverty is a sin! It is a disgrace to the dignity of Gods people and an offense against God. For me, I am learning, often from my wife, how to do the little things with more love and attention. How to share a meal with the kids who show up at dinner time, right at the time when I get home from a long day of frustrating waiting and working very hard to make the smallest bit of "progress". My wife, and the poor, teach me how to open the door of my house and the door of my heart to those around us; how to share a word of encouragement to the kids and how to smile and look with hope at the teenagers who approach us. In order to survive, in a survival reality like the one of Nicaragua, I am learning to stay focused on my small part in making this world a better and more human place to live. Once again, I want to thank you for being a part of that "small part". I would not be here without your help. Love, Pat, Damarys and Chris!